By Marnie Craycroft Filed Under: Montessori, Outdoor Education Tagged With: Learning Environment This post may contain affiliate links. Please read my disclosure for more info. To that end, the natural environment must not be treated as a separate entity from the physical classroom. Rather, it should be an extension of Montessori's structured environment. Whether you're a teacher or parent, you can easily encourage every child to develop a close, personal relationship with nature. Montessori-based schools are typically built in harmony with the surrounding natural environment. Trees, bushes, and landscaping features are maintained with care using eco-friendly methods, and children should have ample opportunities to spend time in nature throughout the day. If you're homeschooling using the Montessori method, you can make your yard or porch an integral part of your child's classroom. Even if your classroom is located in an urban setting, you still have plenty of natural learning options. Consider scheduling regular “nature walks,” where physical activity and natural studies co-exist. Your nature walks can be structured in the vein of scavenger hunts. Give each student a checklist of natural items to look for, such as rocks, leaves, and flowers, and a basket where they can collect their finds. Encourage your students to ask questions about each item they collect. Older children can take nature walks with more of an ecological focus. Perhaps your students can collect litter and recyclables during their trek. As a group, talk about why it is important to dispose of waste properly and use the discussion to help them foster positive life skills. Students can develop gardening skills, patience, and healthy eating habits while spending time outdoors when you have a classroom garden in place. Kids of all ages love to get their hands dirty, planting seeds and watching them grow. Ideally, you should choose edible, organic plants that can be turned into delicious snacks and meals when full grown. Depending on your location, an outdoor garden may be a seasonal project. During the colder months, you can keep your students interested in gardening by creating planting schedules for the upcoming season. Students in over-10 groups can research the types of plants that are ideal for the climate and even create meal plans to be used at harvest time. It's important to remember that spending time outdoors doesn't have to involve a special project or activity. When the weather is nice, your students can get fresh air while doing schoolwork at an outside workspace. Whether you have a row of desks outside or a long table that can accommodate several students, your students are likely to be more productive and happier when completing work in nature rather than a classroom. The structured environment encouraged by Maria Montessori's teachings encourages freedom of movement in a warm, inviting atmosphere where children can socialize and learn. An outdoor classroom, or one that places a strong emphasis on nature, is the perfect place for the “whole child” to thrive. I know these suggestions may be overwhelming. So, in the meantime, here is an easy way to bring nature into your learning environment. By Marnie Craycroft Filed Under: Positive Parenting Tagged With: Homeschool, Learning Environment, Parenting, Project Based Learning This post may contain affiliate links. Please read my disclosure for more info. A great way to supplement your child's learning at school, or to bolster your homeschool program, is by joining monthly learning kits. These subscriptions are rock solid ways to get your child excited about learning and cover a wide range of topics. Here are a few awesome monthly subscription kits my family enjoys. This post contains affiliate links. What are your favorite learning kits? The Brainy Kit focuses on science for early childhood Montessori based classrooms, homes, and homeschool. We received our first box last month. The monthly deal is $40 per month. One off kits are $50. So, yes, a bit pricey, but you get a TON of thoughtful, high quality materials. I am impressed with the thoroughness and organization of the kit. The kit contains hand on learning materials including objects and lesson plans. We signed up and received the Bug Out Kit complete with a puzzle, image cards, book, and lesson plans. Other kit themes include Polar, Under the Sea, and Life Cycle. We first subscribed to Little Passports three years ago. My now almost six year old was not quite ready for the adventure. Since Little Passports developed three alternative adventures based on the child's age. So, my 4 year old receives Early Explorers and my 6 year old receives the World Edition. The kits are put together age appropriately and tell a sweet story of travelers. Early Explorers has a general world theme each month (e.g. music) and the World Edition is based on the adventures of Sofia & Sam as they travel to various countries. Both my sons can't get enough of their “Pen Pals” and are thrilled when the mail delivery is for them. 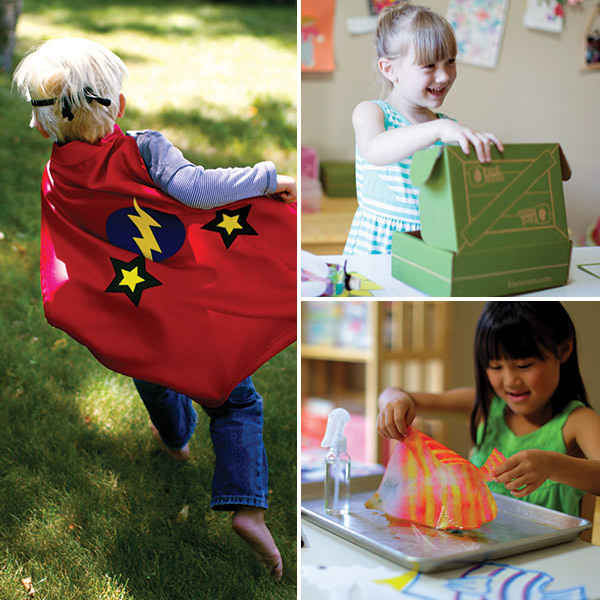 Tinker Crate is one of a few options offered by Kiwi Crate. We have tried Doodle Crate (which is great) but definitely have a sweet spot in our hearts for the Tinker Crate. My six year old needs an adult's assistance putting some of the projects together but the concepts are age appropriate for sure. My four year old understands, too, but he observes more than tinkers or builds with the crate. The quality of the crate is really high. I have never been disappointed with the materials, directions, and absolutely adore the Tinkerzine offered as part of the crate. It expands on the learning and offers next steps and additional guidance if a child wants more! My boys can't get enough. Definitely inspiring! Geared towards K-6, this kit is the supposed to be top notch. We just ordered this kit. To be honest, I thought it was a bit pricey at $25/month if you order for 12 months, $30 if not. With that said, though, I am not impressed with the Magic School Bus monthly subscription. It is okay but I suspect Steve Spangler's Science Club will be higher quality and a bigger bang for our buck! I will certainly update you. Happy Heart Kid offers products for social and emotion learning. One of its kind and really effective. My six year old, especially, really got into his Empathy and Grit kit. These kits are not on a monthly subscription and are worth ordering. I supported this company in a Kickstarter campaign. They offer an Empathy, Courtest, and Grit kit. Within these kits you find an activity book, a craft, and activities focused on teaching the child social and emotional skills. Impressed at this company's effort. It is easy to find an effective way to introduce and teach these skills. By Marnie Craycroft Filed Under: Montessori, Outdoor Education Tagged With: Learning Environment, Theory This post may contain affiliate links. Please read my disclosure for more info. Montessori outdoor activities are my absolute favorite. Dr. Montessori believed that the outdoors is a natural extension of the classroom, that there should be harmony between the indoor and outdoor learning environments. The outdoors is the ideal sensorial experience. A child discovers the world through his senses in the most holistic way. Beyond the organic development through seeing, smelling, hearing, feeling, and, yes, I am going to write it, tasting in the great outdoors, nature brings ripe lessons in botany, zoology, and STEM in the most basic, pure ways. Over a series of Taking Montessori Outside posts, I will do my best to present activities that lend themselves to the Montessori work cycle both indoors and outdoors. My idea of a great activity is not one that can be done in 30 minutes and taped up on the wall. My idea is that children crave more of a rhythm to their learning, that when they go on a Bug Hunt, that it doesn’t stop at examining the bugs in the outdoor habitat, that it goes further, that a child notes the name and continues research in some way at home or in the classroom, at that moment or in a week. The activities cannot all be project based but my goal is that the activities will inspire a desire to learn more and a desire to discover more. I created a downloadable book with over 40 activities covering the Practical Life, Sensorial, Math, and Language areas of the Montessori classroom. You can purchase Taking Montessori Outside: An Activities Guide for Parents & Teachers from my Teachers Pay Teachers store, or purchase by clicking on the “Buy Now” button below! Enjoy! By Marnie Craycroft Filed Under: Montessori Tagged With: Learning Environment This post may contain affiliate links. Please read my disclosure for more info. We are rotating, decluttering, and revamping our boys' space. Their areas are in need of some refreshing change. Here are a few of the particularly exciting changes and items new in our Montessori space. Lego Patent Print – The thing to remember about artwork in a child's space is to place it at the child's eye level (as much as you can). We added a really cool Lego Patent Print. I had the matted frame leftover from another photograph that we had yet to hang in our new home (almost a year and half the frame sat in our closet!). The print was inexpensive and delivered quickly to our home. We found it on this amazing Etsy Patent Prints Store. You will get lost in examining all the cool patents. The BEST part about this cool print is the conversation and dialogue it is bound to create between you and the child. Book Cover Frames – In addition to the Lego Patent Print, I unearthed several colorful frames holding a few favorite children's book covers. My original post on book cover frames is called Simple Things to Do with Book Covers. Seasons Prints – I bought these adorable 5 x 7 prints of the seasons from Etsy. I matched the color frame to the season and placed them on the boys' wall. I placed a Bit of Intelligence Card of Vivaldi next to them. I introduced my boys to Vivaldi's music by playing his beautiful Four Seasons piece. Calendar – I put out our calendar again. I bought this calendar two years ago when arguably even my oldest son wasn't ready for it. Still, they enjoyed the ritual. Then I couldn't figure out a way to make the calendar seamlessly a part of our day. So, I put it away. After several months, I decided that not only are my sons showing a great interest in learning the duration and passage of time, I found a more central location to place our calendar. Here is an affiliate link to the pocket Calendar we adore for our play & learning space. Analog Clock – My older son is showing an interest in telling time. So, what better way to make the learning an organic part of our day than by including a good old clock in their space? I chose analog because digital is everywhere. Analog makes more sense with their brain development and actually learning what it means to tell time (the passage and the duration of time). We placed the clock above the calendar, still low enough to meet their vision. I love this clock because of the simplicity and the classic tick-tock sound emanating from the display. The sound adds a bit of calm to the room. I didn't expect that result. Here is a link to the Clock we bought from Amazon. Maybe I am projecting a bit but I want my children to have a space where they can gaze out the window, at a piece of artwork, or more closely examine an interest simply by being silent and pondering. Slowing down in that way abets us emotionally but also aids in learning. We added a few things that I hope will bring this idea home to them. Wonder Board – In the lower left hand corner you see a close up. This board is a magnetic dry erase board from IKEA. We have a dry erase marker attached to it ready for use. This board is used to capture all those questions and wonders that come up during the day. For instance, recently my sons were wondering about Goose Bumps and How a Floating Bridge Floats. If anything, this board serves as a reminder to me to help guide them to finding the answers and to continue wondering about these interests. Dry Erase Basket – Tinkerlab ignited this idea. Place a basket of dry erase markers near a window. The markers easily wipe off. Children love to draw and doodle with dry erase markers and on windows. This basket invites them to draw and to observe what they see out the window. Child's Artwork – I framed a beautiful painting my son did a few years ago. We like to look closely at it. He tells me what he sees. I enjoy these moments on many levels. Examination Basket – You can place whatever you want in this basket depending on the child's interest at the time. Provide a comfortable space for the child to sit and fill a basket with items he can more closely and deeply examine. In this case, we have rocks and minerals, a magnifying glass, and a small rocks & minerals book. Detailed Prints – These Bit of Intelligence Prints could be used as art work or in an observational space. I love the detail. The prints are a beautiful and simple addition to a child's space. Here I place two old bicycle drawings in the space. On the back of these cards is great information on the image. The cards cover history, vehicles, science, music, and many other topics. Did you enjoy this post? Consider pinning it! By Marnie Craycroft Filed Under: Montessori, Montessori in the Home, Positive Parenting Tagged With: Learning Environment, Parenting, Reading and Writing This post may contain affiliate links. Please read my disclosure for more info. Dr. Maria Montessori viewed child development as a holistic process. There should not be memorization of skills and knowledge thereby “transferring” skills and knowledge to a child. A child should be encouraged and guided to discover learning on his own. This approach will result in a lifetime love of learning and curiosity of life. Dr. Montessori is perhaps most well known for the phrase: “the absorbent mind.” She viewed children’s acquisition of language to embody this idea as children absorb their environment and shape their brains unconsciously during the first three years of a child’s life. Thus, the information and experiences available to a child within his environment greatly impact his language development. As a child grows older, from three to six years old, he consciously leans on his environment to build on the information absorbed in their earlier years. The adult can facilitate his learning by creating an environment, just as the adult did for the unconscious stage, ripe for this conscious learning. Dr. Montessori viewed language as communication, as a way to tell your story about how you see the world, not simply learning to read and write. She believed in allowing a child to discover reading and writing at his own developmental pace, often simultaneously, never forcing a child to read or to write. Furthermore, the environment played a huge part in Dr. Montessori's approach to language at home and at school. Along with other great child development minds, Dr. Montessori believed language learning is at least partly driven by a child’s social environment. There is more to come on this topic of language development. I have written quite a few Language Development posts.